SIIG's USB 3.0 Active Repeater Cable - 15M extends your USB data transmission distance beyond the normal USB boundary. This premium quality repeater cable adds exceptional value, supports data transfer rates up to 5Gb/s, and allows daisy-chain connection distance of up to 30 meters. 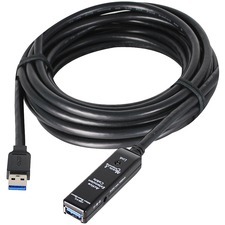 Additionally, this USB 3.0 active repeater cable supports plug-and-play installation, is fully shielded for error-free data transmissions, and features over current protection to protect both connected device and the cable itself from unforeseen power surges.The USB 3.0 Active Repeater Cable - 15M comes with FCC and CE regulatory approvals and complies to RoHS hazardous materials standards. 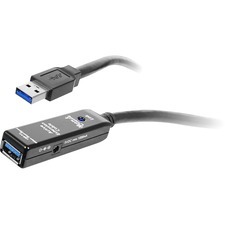 With support for a wide variety of Windows operating systems, and backed by SIIG's limited 3-year warranty, this premium quality USB 3.0 active repeater cable is the smart choice to quickly and easily extend your USB data transmission distance.